This resource is a fantastic bundle for Stage 3 History lessons that focus on Australia as a Nation. The worksheet contains historical information about Sir Henry Parkes, Sir Edmund Barton, Vida Goldstein and Louisa Lawson's contribution to Australian democracy and provides key events that lead to the union of seperate colonies through the Australian constitution. Sir Henry Parkes: This resource contains textual information and a series of dates that must be chronologically ordered. 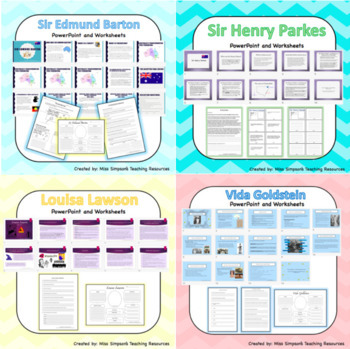 Students must analyse information from the powerpoint and worksheet to create their own timeline of facts about Sir Henry Parkes and democracy. A series of questions on the worksheet enhance students knowledge and revision of the lesson. Factual details about Sir Henry Parkes are provided throughout the powerpoint allowing the teacher to ask a series of open ended questions to extend the learner. 2) Students design their own flags that represent modern day Australia. They must explain their colour choices and symbols used. Student's apply their knowledge from the PowerPoint Slides to answer questions about Sir Edmund Barton and his time in Parliament as Australia's first Prime Minister. Fill in Sir Barton's personal biography that documents his beliefs, occupations, place and country of birth, significant events, birth/death dates and fun facts! - What is a democracy? - What is a sweatshop? Fill in Vida Goldstein's personal biography that documents her beliefs, occupations, place and country of birth, significant events, birth/death dates and fun facts! Louisa Lawson: This resource explains who Louisa Lawson was and how she was dedicated to ensure Australian women had equal rights. The informational slides (pdf) provide definitions: (activist, feminist, suffragist, business woman, author) and cover gender inequality during the 19th century, Lawson's contribution to Australian democracy, what is Feminism? feminism explained and the dedication to Louisa Lawson it also includes 8 reflection questions.